The former head of Germany’s domestic intelligence agency has appeared before the parliamentary investigative committee on NSA activities. He said it was “conceivable” that Germany unwittingly assisted US drone attacks. Parliamentary hearings for the investigative committee on NSA activities in Germany revealed that Germany may have been involved indirectly in helping US drone attacks. The NSA investigative committee organized by the German Bundestag, the lower house of the parliament, heard testimony given by Heinz Fromm, who headed the country’s domestic intelligence agency (Bundesamt für Verfassungsschutz) from 2000 to 2012. In his testimony on Thursday, Fromm detailed the extent to which German intelligence may have facilitated targeted drone killings in Afghanistan and Pakistan. The committee was originally convoked after a number of German nationals were killed in drone strikes in central Asia. “It is entirely conceivable that information delivered by our agency became part of a whole picture that facilitated the execution of such attacks,” Fromm told the investigative committee. Fromm also emphasized that no GPS data was passed on to the NSA to help geolocate potential targets, while mobile phone data, however, may have been shared. It remained unclear to what extent cellphone data could assist in locating potential targets. Fromm also stressed that the ongoing exchange of intelligence with friendly intelligence agencies abroad was “of utmost importance,” but added that his office may have made “errors” in the way it used to deal with the US intelligence agency NSA. Fromm specifically referred to documents implying that employees at his agency may have shared intelligence with their US counterparts in an “informal” manner and without a paper trail. These acts would qualify as being “contrary to protocol,” he specified. Fromm also admitted that his agency used to operate the same software system that the NSA did, an analytical application called “XKeyscore,” after the previous software employed by the Bundesamt für Verfassungsschutz had become too outdated to meet the demands of growing terror threats. Parliamentary hearing impeding intelligence gathering? The German DPA news agency also reported that Fromm’s successor and current head of the Bundesamt für Verfassungschutz, Hans-Georg Maassen, was questioned on the same day. Maassen alleged that the investigative committee was deliberately trying to hinder his agency from operating competently, especially by requesting documents for the hearing, which he said took too much manpower away from more pressing matters. 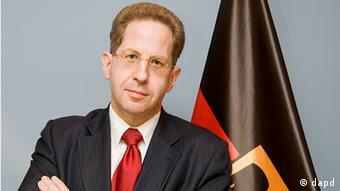 Maaßen added that the NSA accusation had “scandalized” the role and the reputation of all German intelligence services as a whole. Various German politicians, however, have voiced concerns that Germany’s alleged support of the US intelligence agency did amount to a political scandal. Martina Renner, a member of parliament representing the leftwing “Die Linke” party, said there was no attempt to scandalize the agency, adding that the Bundesamt für Verfassungsschutz was rather embroiled in a scandal of its own doing. Social Democratic MP Christian Flisek meanwhile criticized both the domestic and foreign intelligence services for lacking the “organizational skills” to operate competently without relying on outside help.